The following is a compilation of facts I extracted from a psychology thesis I wrote several years ago entitled "A STUDY FOCUSING ON THE FORMATION OF OPINION, AND THE KNOWLEDGE ASSOCIATED WITH ITS DEVELOPMENT." The study itself is long and boring but there are some facts I'd like to bring to light about the United States government and the history of biological weapons and warfare, especially as it relates to the aforementioned government. I want to make this absolutely clear, this particular article should not frighten the reader, the truth is that biological agents are very unpredictable and can harm those that unleash them just as it can those targeted. To sum it up neatly, after decades of research the United States government's conclusion concerning defense against biological agents is that there is no defense against them, a virus can be quickly and inexpensively "tweaked" so that all known vaccines are rendered ineffective, meaning that vaccine manufacturers would have to start all over from the beginning, which is quite time consuming and expensive, thus there really is no point if you get my meaning. I wrote the above thesis back in 2002 when I still believed the government's "official version" of what happened on 9-11. When I still believed the government's "official version" of the anthrax letters. Needless to say, I no longer believe these lies. What the United States government and for that matter, most western governments have more than proven of late, is that they cannot be trusted and are not representing their national populations. Just today I read where an entire Italian University was shut down to prevent Dr. Robert Faurisson from speaking there. For those of you unfamiliar with Dr. Faurisson, he's a notable "historical revisionist," that doubts the "official version" of the holocaust narrative. I ask you the reader, what is the University so frightened of? Have you ever heard of such a thing? In any case, below I have included a number of facts the Zionist media and Zio-American government will never tell you about. All of them are cited/sourced in the bibliography of my thesis, so please, do not hesitate to investigate further. 1. Mathew Meselson a professor of molecular biology at Harvard, and American notable in the area of chemical and biological warfare, reinforces the fact that the United States government has extensively researched and developed biological weapons in the past. Meselson described an American facility, north of Terre Haute, Indiana, built in 1944 that would have produced 500,000 four pound anthrax bombs monthly once in full operation. Professor Meselson's notable achievements in the field of biological weapons research include being part of teams that proved the accidental release of anthrax at a Soviet facility in 1979, disproved charges of biological warfare in Laos and Cambodia in the late 1970s, and Meselson was a driving force behind popularizing the Chemical Weapons Convention in 1994 (Academy of Arts and Sciences, 1999). The United States Government also concurs with the scientists, politicians and authors thus far noted, albeit in a more subdued, but equally certain stance. A Congressional Office of Technology Assessment (OTA) study conducted in 1993 ascertained that one hundred kilograms, or a mere two hundred and twenty pounds of anthrax could under optimal conditions, kill as many as three million residents of Washington D.C (Office of Technology Assessment, United States Congress. 1993)In academic circles, the word "optimal" might stand out as a word reducing the true significance of the potential anthrax represents to Americans, but if one considers a reduction in the efficacy of said biological agent, and perhaps investigates a sub-optimal release with only a three or four percent total potential, then one must still grasp the fact that 90,000 to 120,000 people would still die. 2. In contrast to the killing capacity to weight ratio of anthrax, Peter Burgasov, former Chief Sanitary Physician of the Soviet Union, admitted to the Courier, a Russian newspaper in November 2001, that the Soviet Union had been testing smallpox as a weapon since at least the 1970's and described one particularly disturbing test conducted on an island in the Aral Sea "A research ship of the Aral fleet came within 15 kilometers away from the island (it was forbidden to come any closer than 40 kilometers) The lab technician of this ship took samples of plankton twice a day from the top deck. 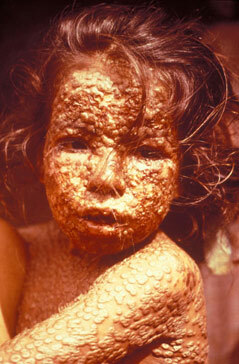 The smallpox formulation-400 grams of which was exploded on the island -"got her"- and she became infected." (House International Relations Committee, on Bioterrorism, 2001). The aforementioned OTA study focuses on what is to be expected immediately after an attack, and does not take into account the fact that anthrax spores will continue to represent a viable threat for decades as it would thoroughly contaminate the soil, and leave the entire area under quarantine for generations. An example of anthrax's longevity can be seen even today, from afar, on the Island of Gruinard off the coast of Scotland. The British conducted experiments with anthrax there during World War Two, and the entire area has been closed to the public since, and more than five decades later still represents a threat to human life despite the fact that the British government has attempted in every scientific way to make the area safe (Hersh, 1968; Alibek, 1999). 3. A former top-level Soviet scientist involved at the highest echelons with research on biological agents named Ken Alibek discloses in detail an incident that occurred in Sverdlovsk Russia in the late 1970s. Much of the incident was known about already through an investigation conducted by U.S. analysts, but the full details were not known until Alibek defected to the United States and told the entire story. In March 1979, a Soviet technician accidentally forgot to replace a vital filter in the anthrax production facilities ventilation system resulting in a release of anthrax into the surrounding community. Dozens of people died, a local communist party chief immediately ordered a cleanup, which disturbed the already settled anthrax spores, and re-infected people through secondary aerosols (Alibek, 1999). Predictably, the Soviet government initiated a cover-up, and all the facts weren't known until 1993. The American Defense Intelligence Agency published a report in 1986 outlining what it knew about the accident at Sverdlovsk, and pointed out some significant facts about the attempts on the part of the Soviet government to decontaminate the area after the exposure. Incidentally, the Defense Intelligence Agency also emphasizes the fact that only twenty-two pounds, approximately ten kilograms was accidentally dispersed into the atmosphere. The following observations were noted in the report, demonstrating the fact that decontaminating an area contaminated by anthrax spores is difficult at best, and impossible overall (Defense Intelligence Agency report: 1986, Pp, 4-7).· Initial disinfection and decontamination procedures were largely ineffective.· The extraordinary efforts to clean up were inconsistent with the Soviet explanation.· The reported aerial spraying activity and disinfection with steam and hypochlorite, a bleach solution around the military installation are clear attempts to decontaminate areas affected by infectious aerosol. Osterholm and Schwartz (2000) argues that a fairly remedial background in biology is all that is necessary to produce significant quantities of anthrax in one's basement, completely countering the Federal Bureau of Investigations contention, as emphasized by the media, that a massive infrastructure, knowledge, scientific, and economic resources are necessary. An example of this belief can be found in the following article, alongside a most erroneous statement suggestive of the fact that the authors hadn't done their homework. "Militarized anthrax spores are so difficult to manufacture that only a handful of countries with large military-industrial establishments have ever developed the capacity"(Department of Health and Human Services, 2000). "There has never been a confirmed use of anthrax spores, anywhere, by anyone, in a military or terrorist attack" (Department of Health and Human Services, 2000). This report was indeed written prior to the anthrax letters to Daschle and various media representatives, but it was written more than fifty-years after known Japanese military use of anthrax in Manchuria during World War Two (Eitzen & Takafuji, 1997). The Japanese use of biological agents in warfare was cited by Osterholm and Schwartz (2000, p. 70), Alibek (1999, p. 36-37), and Hersh (1968, p. 12-18). In short, it was a fairly well known fact, and should not have been missed by the Department of Health and Human Services.The idea that bacterial growth and dissemination requires advanced technology and/or weapon systems is equally nonsensical, and is dismissed by Osterholm and Schwartz as well as other experts within the pages of their book on the topic (2000, p.112-117). "One government analyst some years ago determined that $1,500 of nuclear killing power would set an anthrax assailant back by only a penny" (Osterholm & Schwartz, 2000, p. 8). Leonard Cole (1988) supports this by citing expert information provided to the United Nations in 1969 stating that a square kilometer of ground costs approx $2000 to take with conventional weapons, $800 with nuclear, $600 with nerve agent, and a single dollar with Biological agents.This would seem to cast some doubt on the governments position that a large economic base is essential, thus effectively ruling out a rogue individual, or loose knit terrorist organization. In fact, one encounters the experts differing from this line of thinking all together. Kenneth Alibek stated clearly on October 24th, 2001, in response to the question, "is anthrax really that hard to get your hands on," "In my opinion, it's not very hard" (The Money Gang, October 24th). In another televised interview Alibek detailed the fact that there is an island in the Aral Sea completely contaminated with anthrax spores, and that if anyone wanted to acquire them, there were no guards, and that "it wouldn't be a big problem." The former Soviet scientist added the fact that the anthrax spores that could be found on this island were also genetically engineered, making them antibiotic resistant (48 Hours, 2001,October 19th). 5. Where would one acquire anthrax if so inspired? Prior to the recent terrorist attack associated with the anthrax letters sent to Daschle and various media figures, one could actually order it from labs across the country. It was in this manner that a gentleman named Larry Wayne Harris, associated with fringe elements in the political arena, acquired both plague samples and anthrax samples. He was dismissed as a threat by the government when this fact was exposed, because it was said that the strains he obtained weren't exceedingly virulent (Osterholm & Schwartz, 2000). Perhaps the government wished to get the case out of the public's mind as quickly as possible because Harris obtained the plague samples through the mail simply by writing to the American Type Culture Collection (ATCC) and requesting it. Essentially, luck played a role in his capture, and law enforcement officials were able to confiscate the bubonic plague sample from his glove compartment. According to congressional testimony provided by Representative John R, Kasich "what he (Larry Harris) did was not a crime," and at least in 1996, "the law currently treats the improper disposal of motor oil by a service station more severely than what Harris did" (Senate Committee on the Judiciary, 1996, March 6). Harris is not the only example of someone acquiring lethal biological agents through the ATCC. Iraq also acquired their anthrax by mailing requests to the ATCC, as did a religious cult in Oregon who used their easily acquired bacteria to infect the town of The Dalles, in Oregon with a strain of salmonella in the 1980s (Miller, Engelberg, & Broad, 2001). When one considers these disturbing facts, one might conclude that perhaps the government, its analysts and experts have forgotten that bacteria's primary mission is to grow, and in anthrax's case encapsulate itself indefinitely when the environment proves too hostile to proliferate. Another unique quality, perhaps forgotten by the government, is bacteria's ability to mutate, and in many cases this mutation can be easily manipulated by using animals as incubators. Progress on the phenomena associated with mutations and bacteria was well developed by 1968, allowing for an increase in virulence, longevity, resistance, and a variety of other adaptations (Hersh, 1968). By the early 1980s, mutation and DNA recombinant techniques had reached a point where at least one (Harris, 1982) author felt that "ethnic germs" or ethnically selective bacteria might be a possibility. Additionally, genetically engineered viruses affecting the way an immune system responds to infection were thought to also be under research. The author also asserts that such a germ may already have been developed by 1982 (Harris, 1982). Joshua Lederberg, a Nobel Laureate, Professor, and pioneer in the fields of genetic exchanges in bacteria, and microbial genetics also acknowledges the theoretical likelihood that "ethnic germs" are on the horizon (Miller, et all, 2001).Alibek (1999) details the fact that an accidental release of anthrax into a city sewer system in the Soviet Union exposed rats to anthrax, killing them. However, before they died some of the rats unwittingly participated in an incubation process that increased the virulence of the original strain. Soviet scientists proceeded to weaponize the new deadlier strain, calling it anthrax 836. 6. The Federal Government admitted in a study conducted in the 1960s, that biological warfare scientists concluded that an, "Attack with disease was possible, indeed terrifyingly simple". They further concluded that the United States was, "Highly Vulnerable," to a germ warfare attack (Harris, 1982). Nearly forty years later, little has changed. The government is still unprepared to meet the challenges associated with a biological attack. In 1960 "the head of the Army Chemical Corp warned congress that a potential enemy could perhaps kill or perhaps seriously disable 30 percent of the American population by mounting a biological warfare attack with ten aircraft" (Hersh, 1968, Pp. 68). The author Richard McCarthy also emphasized the fact that the American government had "no defense" against biological warfare in 1969 (McCarthy, 1967).In a Center For Civilian Biodefense Strategies (CCBS) report, the center revealed, "there are currently no atmospheric warning systems to detect an aerosol cloud of anthrax spores. The first sign of a bioterrorist attack would most likely be patients presenting with symptoms of inhalation anthrax" (CCBS, 2000). According to the same CCBS report, those presenting with symptoms of inhalation anthrax are most likely to die, reinforcing the fact that those who have developed symptoms will in ninety percent of cases expire. Additionally, the report then acknowledges a little known fact, "U.S. vaccine supplies are limited and U.S. production capacity is modest. There is no vaccine available for civilian use" (CCBS, 2000). 7. In fact, the United States Government should be exceedingly familiar with many scenarios involving biological agents, and possible consequences, perhaps more so than any other nation in the world. The U.S. government has sanctioned the exposure of its own population to various, allegedly benign, bacterial agents including serratia marcens, and bacillus subtilus. In the end these agents weren't entirely benign, and caused the deaths of American citizens submitted involuntarily to experiments conducted without their consent or knowledge (Cole, 1988). As recently as 1996 the integrity and honesty of the United States government was called into question concerning American soldiers that had developed symptoms during the Gulf War that could not be explained. Patrick Eddington, a one-time CIA analyst, allegedly was fired by the agency for claiming it was covering up the fact that the Iraqis had actually used chemical weapons on U.S. soldiers during the war. David Martin, a CBS reporter, interviewed Eddington asking him, "Would you call it a cover up?" Eddington responds by saying, "yes, I would describe that as a cover up." Eddington then concludes the interview by stating, "the culture of the CIA is one that does not really welcome those who rock the boat, who question prevailing assessments, who question prevailing views" (CBS Evening News, 1996, October 30). Two days later, the CIA came out with its official response to Eddington's accusations, stating in effect that the agency "continued to conclude that Iraq did not use chemical or biological agents during the Gulf War" (Slatkin, 1996, November 1). 8. The U.S. Army did subject the New York City population to an experiment in the 1960s concerned with measuring "saturation rates," or the amount of bacteria one would inhale at certain times, and in specific locations after the initial release. Light bulbs containing eighty-seven trillion bacilli each were dropped onto ventilation grates above the New York City subway system. It was deduced that within minutes exposed individuals were inhaling a million bacilli per minute, and were entirely unaware of it. Additionally, the subway trains created a vacuum of sorts that conveniently spread the bacilli throughout the system with little effort (Cole, 1988). The implications of the New York subway system experiments are truly horrific. People breathing in a million bacilli per minute were not aware of it in any way. If government reports are accurate concerning the lethal dose of anthrax being in the neighborhood of eight thousand spores in total, which incidentally is in dispute in some scientific circles, then one might conclude that anthrax represents a serious threat today. Bacillus subtilus is similar to anthrax in that it is a sporalating gram-positive rod bacterium, and aerosolizes, as would anthrax. If a light bulb can contain eighty-seven trillion bacilli, if filled with anthrax it would represent enough to kill the entire human population on terra firma more than twice over, with approximately 10,875,000,000 individual lethal doses, with eight thousand spores representing a lethal dose. This fact becomes especially frightening when one considers the Soviet Union always maintained a stockpile of hundreds of tons of anthrax at all times. In fact, according to Ken Alibek (1999) anthrax production at one facility alone could be as much as 500-600 kilograms daily. 9. One of the more frightening scenarios encountered in the research of this thesis was whether or not anthrax could be passed through currency. Certainly everyone is now familiar with the fact that it traveled rather nicely inside envelopes. On the issue of whether or not anthrax can be carried on currency, there is a great deal of contention among different sources. Ted Koppel admitted on Nightline, "the possibility is scaring me to death. Please tell me it's not possible." In response to Koppel's concerns the Department of Health and Human Services replied, "highly unlikely," "highly improbable," "almost impossible." The Treasury Department, in their apparent expertise, stated that, "there is no way to embed anthrax in the currency" (Nightline, 2001, October 17). Oddly enough a study conducted in 1972 and reported in a Discover magazine article determined that staphylococci, micrococci, diptheroids, and propriobacteria, were present and viable on randomly tested bills of various denominations (Discover, 1998). A second study conducted in 1997 found that 3% of coins, and 11% of all bills tested were positive for bacteria. In 1998, another study conducted by the University of California at San Francisco found in 113 examples of currency samples that most of the bills grew "harmless bacteria" but 18% of coins, and 7% of bills manifested pathogenic bacteria, including E-Coli, and Staphylococcus Aureus (Discover, 1998). Shirley Lowe, a microbiologist credited with conducting the study on behalf of the University stated that "half the money," she obtained from a doughnut shop grew Staphylococcus Aureus (Discover, 1998). I think the gist of this article, Filthy Lucre, is that money, especially currency with its 75% cotton, 25% linen composition is a more than suitable vector for bacteria.Also mentioned in the same article was the fact that bacteria can't live on the dry acidic surface of money forever, as it requires a moist warm environment to grow. This is very true with most bacteria, but untrue in respect to anthrax spores, as the spores themselves are nearly impervious to the environment, and when introduced into a receptive environment, will then proliferate. Possibly the most significant aspect of this entire article devoted to money is not the revelation that bacteria can survive on currency, but that cocaine hydrochloride was known to cross-contaminate currency at the counting-sorting machines used in banks and at the Federal Reserve as early as 1997. The article Filthy Lucre proceeds to mention that a study conducted at the Houston Advanced Research Center in Texas found that 70-80% of all currency had trace amounts of cocaine hydrochloride on them. In older bills that had been in circulation for some time, 90% had cocaine traces (p.82). The Journal of Forensic Sciences conducted a study in May 1998 that concluded that more than 93% of all bills tested had trace amounts of cocaine hydrochloride present. In 1997 Tom Jourdan, chief of the Materials and Devices unit at the FBI lab in Washington D.C. found that 90% of bills tested were positive for cocaine. Tom Jourdan stated that it is his belief that "mechanical currency counters are homogenizing money." According to Jourdan, "one contaminated bill brushed through the counting machine at the bank can contaminate the entire stack"(p.84). The last paragraph in the article Filthy Lucre states exactly, "So money isn't exactly squeaky clean. But it isn't exactly going to do us in either. If there's a lesson here, it is that money reflects whatever activity, and mischief, that human hands get up to-and the activity and occasional mischief of all the microscopic organisms along for the ride on our skin" (pg 84). This last statement could prove to be more prophetic than the author ever intended, with the exception of the "isn't exactly going to do us in" part, which may prove one day to be overly optimistic. It would certainly seem feasible that if cocaine hydrochloride could "homogenize" money, then anthrax ought to be able to as well. Perhaps the greater concern here is not the possibility that anthrax can cross-contaminate money, but that the FBI was apparently unable to deduce the commonalities between currency, and envelopes.